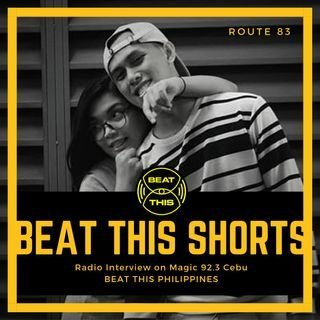 BEAT THIS SHORTS is a podcast version of the radio show focusing ON AIR interviews of featured guests on Magic 92.3 Cebu and on this episode, we talked with Cebu-based electronic pop duo, ROUTE 83, last February 24, 2019, on their latest release "I Don't Wanna Know" and how it was like working with Kurt Fick. Take a listen and know more about ROUTE 83. BEAT THIS PHILIPPINES is a concept show that started around June 2017 in association with Local Vocal Radio heard on terrestrial ... Maggiori informazioni radio station, Magic 92.3 Cebu. The idea was to compile and feature music from the Philippines that are in the electronic beats and digital sound production category. We showcase a wide range of genre dedicated to what most call “computer music” including Hip Hop, EDM, Indie-Alternative and Pop. Our goal is to document and share to you Philippines’ best music producers, beat makers, sound designers and the artists that are in it.